For the New Zealand footballer, see Richard Mulligan (footballer). For the professor of genetics, see Richard C. Mulligan. Richard Mulligan (November 13, 1932 – September 26, 2000) was an American television, film and character actor known for his role as Burt Campbell, the loving, preventive husband of Cathryn Damon's character, in the sitcom Soap (1977–81) and later for his starring role as Dr. Harry Weston in Empty Nest (1988–95). He was the younger brother of film director Robert Mulligan. Mulligan was born on November 13, 1932, in New York City. After attending Columbia University, Mulligan began working in theater, making his debut as a stage manager and performer on Broadway in All the Way Home in 1960. Additional theatre credits included A Thousand Clowns, Never Too Late, Hogan's Goat, and Thieves. Mulligan made a brief, uncredited appearance in the 1963 film Love with the Proper Stranger, which was directed by his elder brother. He starred with Mariette Hartley in the 1966-67 season comedy series The Hero, in which he played TV star Sam Garret, who in turn starred on a fictional series as Jed Clayton, U.S. Marshal. The Hero lasted only 16 episodes. Another notable TV appearance was on the I Dream of Jeannie episode "Around the World in 80 Blinks", as a navy commander accompanying Major Nelson (Larry Hagman) on a mission. Mulligan's most notable film role was as General Custer in Little Big Man, whom he portrayed as a borderline psychotic. He also appeared in the disaster movie spoof, The Big Bus (1976), where he was reunited with Larry Hagman, with whom he starred in an episode of I Dream of Jeannie (see above). As for his radio work, he starred in the adaptation of Edgar Allan Poe's "The Oblong Box" heard on The CBS Radio Mystery Theater (1975). His highest profile roles in television were as Burt Campbell in the sitcom Soap (1977–81), for which he won a Best Actor Emmy Award, and as Dr. Harry Weston in the NBC series Empty Nest, a spinoff of The Golden Girls in which his character had appeared in a couple of episodes. Empty Nest ran for seven seasons, and Mulligan won a Best Actor Emmy Award as well as a Golden Globe Award for his performance. He also played Secretary of State William Seward in Lincoln (1988), a TV movie based on Gore Vidal's novel. Mulligan returned to perform on Broadway and in films, in which he usually played supporting roles. A notable exception was the black comedy S.O.B. (1981), in which he played lead character Felix Farmer, a Hollywood producer-director modeled on the film's actual producer-director, Blake Edwards. The film again featured Larry Hagman. Mulligan was cast as Reggie Potter in the television series Reggie (1983). Lasting for only six episodes, it is a loose adaptation of the BBC series The Fall and Rise of Reginald Perrin. In the 1984 film Teachers, he played an eccentric high school history teacher (who in one scene teaches the Battle of the Little Bighorn, once more dressed as General Custer). In 1985, he appeared in The Twilight Zone episode "Night of the Meek", where he took on the role of Henry Corwin, an alcoholic department store Santa Claus who becomes the genuine article, in the remake of the 1959 Christmas episode "The Night of the Meek", the character that Art Carney had played in the original version. The next year, he appeared in another episode of the series, "The Toys of Caliban". He appeared in Disney's 1988 film, Oliver & Company, as the voice of the oafish Great Dane named Einstein. His final performance was a voice over on Hey Arnold! in 2000 as the voice of Jimmy Kafka, the long mentioned but never seen former friend of Arnold's Grandpa. Mulligan married four times. He was first married to Patricia Jones from 1955 to 1960, with whom he had a son, James. That was followed by marriages to Joan Hackett from January 3, 1966 to June 1973 and Lenore Stevens from 1978 to 1990. His last marriage was to adult film actress Rachel Ryan on April 27, 1992, which lasted two years. After making his last appearance in an episode of Hey Arnold!, on September 26, 2000, Mulligan died of colorectal cancer at his home in Los Angeles, California. At his own request, his remains were cremated and there was no funeral service. Mulligan was survived by his son James Mulligan from his first marriage, and two brothers, Robert and James. On September 30, 1993, Mulligan received a star on the Hollywood Walk of Fame for his work in the television industry, located at 6777 Hollywood Blvd. 1963 Car 54, Where Are You? Patrolman Episode: "The Curse of the Snitkins"
1963 Route 66 County Prosecutor Episode: "Shadows of an Afternoon"
1967 The Rat Patrol Major Lansing Episode: "Take Me to Your Leader Raid"
1967 Mannix Dr. Bob Adams Episode: "Beyond the Shadow of a Dream"
1967 Gunsmoke Jud Pryor Episode: "Wonder"
1969 I Dream of Jeannie Wingate Episode: "Around the World in 80 Blinks"
1970 The Most Deadly Game Jordan Episode: "Witches' Sabbath"
1971 Love, American Style George Episode: "Love and the Jury"
1971 Police Surgeon Kramer Episode: "A Taste of Sun"
1971 Bonanza Dr. Mark Sloan Episode: "Don't Cry, My Son"
1971 Bonanza Farley Episode: "Kingdom of Fear"
1971 The Partridge Family Dr. Jim Lucas Episode: "Why Did the Music Stop?" 1972 Circle of Fear Tom Episode: "House of Evil"
1973 The Partridge Family Mr. Lipton Episode: "The Diplomat"
1975 Medical Story Dr. Ted Freeland Episode: "The Right to Die"
1975 Matt Helm Jack Harte Episode: "Dead Men Talk"
1976 Little House on the Prairie Granville Whipple Episode: "Soldier's Return"
1976 Switch Andy Rowen Episode: "The Argonaut Special"
1976 Charlie's Angels Kevin St. Clair Episode: "Night of the Strangler"
1976 Spencer's Pilots Babcock Episode: "The Matchbook"
1976 The McLean Stevenson Show Lloyd Episode: "Oldie But Goodie"
1976 Gibbsville Ben Episode: "Saturday Night"
1977 Hunter Dr. Harter Episode: "Mirror Image"
1977 Kingston: Confidential Harlan Scott Episode: "Triple Exposure"
1977 Dog and Cat Brother Saul Episode: "Brother Death"
1977 The Love Boat Ron Larsen Episode: "Ex Plus Y"
1978 The Love Boat Mark Littlejohn Episode: "Where Is It Written?" 1986 The Twilight Zone Ernie Ross Episode: "The Toys of Caliban"
1986 Highway to Heaven Jeb Basinger Episode: "Basinger's New York"
1995 The John Larroquette Show Richard Hemingway Episode: "An Odd Cup of Tea"
1997 The Angry Beavers Old Gramps Episode: "Fish and Dips"
2001 Hey Arnold! Jimmy Kafka Episode: "Old Iron Man"
1 2 3 Van Gelder, Lawrence (September 29, 2000). "Richard Mulligan, 67, Actor On 'Soap' and 'Empty Nest'". The New York Times. ↑ "Richard Mulligan (1932 - 2000) - Find A Grave Memorial". Retrieved 8 April 2016. 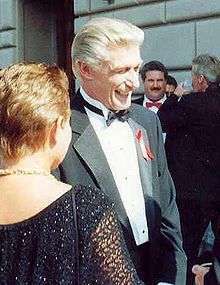 ↑ "Emmy-winning star of 'Soap' Richard Mulligan dead at 67 [Archive] - Sitcoms Online Message Boards - Forums". Retrieved 8 April 2016. ↑ "Richard Mulligan - Hollywood Walk of Fame". Retrieved 8 April 2016. ↑ "Richard Mulligan - Hollywood Star Walk - Los Angeles Times". projects.latimes.com. Retrieved 2016-10-04.